At the Long Beach Resort -Tower 1, 9th Floor. This condominium rental sleeps eight very comfortably, with a king-size bed in the master bedroom, two queen sized beds in the second bedroom and a queen size sofa sleeper in the living room. Amenities include FREE WIFI, a Home Theater entertainment center with NEW 47' LCD FLAT PANEL TV , DVD, CD, AM-FM Radio and full surround sound. A full mirrored wall brings the ocean view into the unit through a glass wall with sliders to the balcony. The dining area seats six and is separated from the kitchen with a breakfast bar which seats 3. The kitchen is fully equipped with built in microwave, dishwasher, etc. There are two full baths. Each bath features a large (over sized) tub and double vanity. The unit also has a washer and dryer in a utility room. The master bedroom has one wall overlooking the gulf with floor to ceiling glass and also door access to the balcony. The master bedroom also has a 29”flat panel television,& DVD player. The second bedroom also has one wall overlooking the Gulf with floor to ceiling glass and door access to the large balcony. There is a 27' flat panel TV & DVD player. There are over 40 feet of windows overlooking the Gulf! Our unit offers some of the most magnificent views in Panama City. You overlook the sugar white sands and blue green water of the Gulf or Mexico. The balcony is furnished comfortably to allow you to enjoy the outdoors throughout the day and evening. Long Beach Resort features 1,300 feet of magnificent white sand beach and beautifully landscaped tropical grounds. 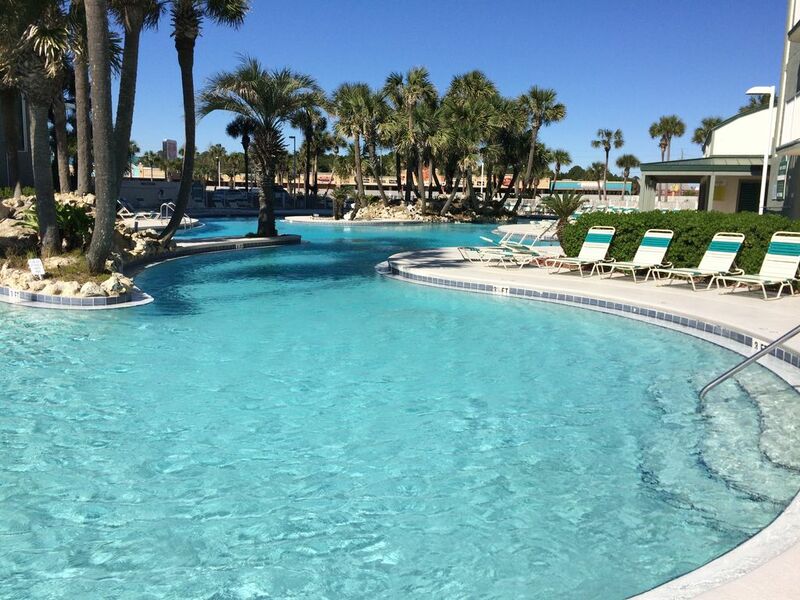 The 6,800 square foot lagoon pool with waterfalls and palm tree island creates truly Caribbean atmosphere. In addition there are two heated Polynesian pools and three whirlpool spas. The “Hang Out” snack bar and grill is right at the pool. The Resort also has on-site availability of jet ski rentals, para-sailing,pontoon boat rentals and beach chair and umbrella rental services. Located in the heart of one of the top beaches in America, your vacation retreat is near family entertainment, 8 local golf courses, outstanding restaurants, shopping & Pier Park Mall with IMAX theater, Shipwreck Island Water Park, Gulf World Marine Park, St Andrews State Park, WalMart Superstore within walking distance and more. Walk to Pineapple Willy’s for a drink at sunset and across the street to Pompano’s for a seafood feast! Everything is available to make your vacation one of the best you’ll experience. My husband and I live in Grand Rapids, Michigan and Panama City Beach ,Florida. We enjoy traveling and outdoor activities. We chose to buy 3 condos at the Long Beach Resort because of the spacious floor plans, the fabulous views from inside the condos and from their large balconies. It is a lovely resort right at the beautiful gulf & beach. Panama City Beach has some of the most beautiful beaches in the US. Travel magazines have voted it as one of the top beaches in the world. PCB has beautifully groomed white sand. However, the beaches are not the only attraction in PCB. There is a lot of shopping & Pier Park Mall, golfing and other tourist sites. Ripley's Believe It or Not, Gulf World & Shipwreck Island Water Park, Shell Island, night clubs like Club LaVela are a few that come to mind. A great place to take your family on vacation, Panama City Beach is sure to bring wonderful memories. Each bathroom has 4 bath towels, 3 hand towels, 4 washcloths. Board games, cards, & puzzles are in the living room cabinet. There is boat and wave runner rental on the beach in front of the resort. My family and I really enjoyed our time at Panama City Beach and the Long Beach Resort. We really appreciated the condo we stayed in. The unit was clean and was well taken care of. We really enjoyed the spaciousness and the amazing views from the living room and both bedrooms. The main pool was nice. It would have been even nicer to have the pool and hot tub available at our tower. I must admit it was an inconvenience not having a working bathroom, at ground level, near our unit so that we could access it from the beach. All in all, an enjoyable vacation on a beautiful beach. The condo was very clean. The beds were very comfortable. The views from the balcony were beautiful. It was a great location in walking distance to a lot of places. It was a great vacation. Thanks for everything. We had a wonderful stay in this two bedroom condo. Great Condo, very very clean, we felt being home, didn’t miss anything. Highly recommended. You will not regret to stay here. I can't say enough about this rental. It looked exactly like the pictures and Angie was so helpful and checked on us during our stay. The views from the balcony are spectacular! We had a great time and looking forward to staying next year. Conveniently located in the heart of Panama City Beach, our Long Beach Resort is close to restaurants, shopping, and entertainment of all ages. Nearby are great golf courses, deep sea fishing charters, amusement parks, water park, zoo, dolphin boat tours & snorkeling,Gulf World, mini golf, Ripley's Odditorium, WonderWorks, car, motor scooter, & bicycle rentals, St Andrews State Park & fishing pier. Directly in front of the resort on the beach there is jet skiing, parasailing, banana boat rides, & pontoon boat rentals. Rates are subject to change until reservation is confirmed. This is a NO SMOKING & NO PETS unit. Smoking is allowed outside on balcony. The responsible renter must be at least 25 years old and staying in the condo.International payments are subject to a $25.000 processing fee.